It was an easy walk from our downtown Madrid hotel to the train station. 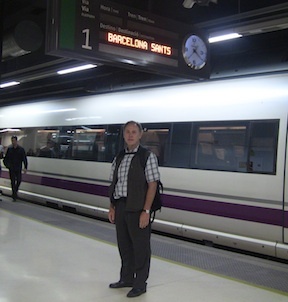 In less than 3 hours on high-speed rail, we crossed the country to Barcelona. I looked out the window as we traveled at 185 miles per hour leaving the hot plains for the cooler Mediterranean. Traveling car free made the vacation relaxed, talking with locals easy, and neighborhoods a joy to walk. The vacation was a welcome respite from the gridlocked expressways of America. Where I live in California, highways are being widened at a taxpayer burden of $200 million per mile. Locals in Atherton, Palo Alto, and Menlo Park, armed with signs that shout “Not In My Backyard”, are holding up the California High-Speed rail, at one-third that cost per mile. They claim that HSR is too noisy to run through cities. Tell that to all the people in Europe and Asia who are 50 years ahead of us, none wearing earplugs as these trains glide through the hearts of their cities. California HSR would connect 25 major transit systems together, and pay for itself in avoided freeway and airport expansion. Diesel rail would be replaced with electric rail at the same time California’s energy mix is increasing from 20 to 33 percent renewable. My wife and I found it easy to zip around Madrid and Barcelona on their efficient metro subway and bus systems. Normally, however, we choose to walk miles daily so that we could experience the sights, restaurants, and people up close and personal. For busy commuters, however, walking is popular when the distance is under a half-mile. Beyond that, a car is selected over transit, unless other “last mile” solutions are convenient. For over 100,000 in Barcelona, their “last mile” solution is taking a bicycle down tree covered bike lanes that I enjoyed riding. May bike lanes were safely seperated from the car lanes, but others disappeared into hair raising intersections. Barcelona has 9,000 bicycles in Bicing, a bike sharing subscription program that costs 35 euros per year with added charges for keeping a bike more than 30 minutes. A member goes to one of 400 convenient on the street locations, holds their RFID smartcard near the display, sees which bike to take (e.g. Space 18), rides to their destination, and then secures their bike in the new location. Bicing offers its 100,000 members a smart app with location map and extensive information. 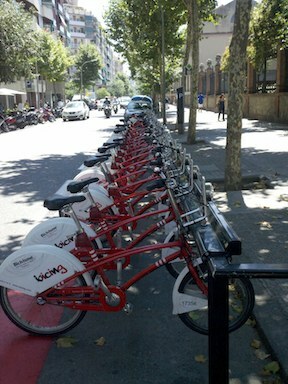 Bicycle sharing has millions of members in European cities. It is now taking foot in the U.S. in Washington DC, Twin Cities, Chicago, Denver, Tulsa, San Antonio, San Francisco, and other cities. Some include special programs for employers and universities to facilitate broad participation. In America, these commuters save a fortune in car costs, gasoline, and parking fees. As a plus, they get some healthy exercise. Austin, Texas, has modeled the successful point-to-point (P2P) bicycle sharing with 300 shared Mercedes SmartCars. Someone can exit transit, drive the SmartCar three miles to work, park the car and walk away, paying pennies per minute. In the future, the SmartED electric car will be included in the Austin P2P car sharing. Millions of visitors to the London Olympics next year will have the opportunity to use a different electric approach – personal rapid transit (PRT). They will get in a pod on an electric rail at Heathrow Airport, push the destination button as someone would in an elevator, and glide a few miles to their destination. 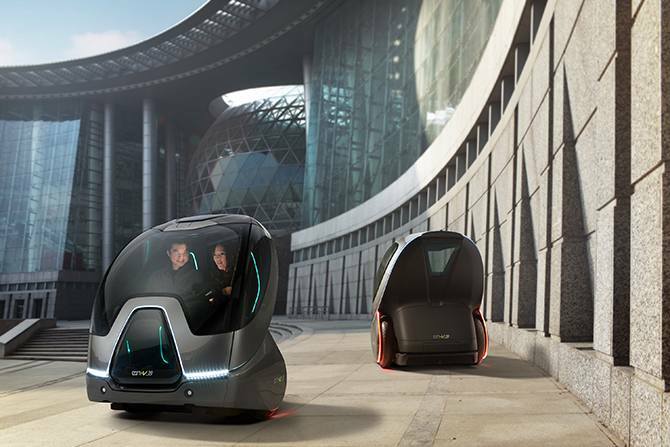 Looking to the future, automakers see new opportunities in urban mobility. Car makers observe the millions of us who use mobile devices with smart apps to best get through our busy days, at times in a car, at times walking, and at times using new technology. I had the opportunity to test drive the General Motors EN-V urban mobility concept vehicle. The friendly little two-seat pod rests on a Segway drive system. It could easily be steered around the Standor University campus, where the event occurred. In the future, these new light electric vehicles could be navigated along mobility pathways separated from cars in a gridlocked city. The EN-V can also navigate autonomously, automatically stop for pedestrians, and cluster into compact convoys. A few EN-Vs, or a few dozen, can form themselves into a convoy and route themselves to where they are needed. This would solve a problem that costs millions to manage for P2P car sharing and bicycle sharing. Vehicles must be moved after they cluster in popular destinations. Today some bike sharing members abandon programs after they cannot locate a shared bike when late to work, or get charged extra when every space in the bike rack is full. Personal PRT such as the EN-V could automate having the right vehicles in the right places at the right times. Could such innovation happen in the USA? Yes. When I visited the vast Marine Corp Camp Pendleton, I saw 291 electric vehicles in use. The military is very interested in autonomous vehicles, especially those that free us from our dependency on oil. A GM scientist told me that China has enormous potential. Cities the size of New York are being developed through out China. They will have good transit, which is connected by 20,000 miles of high-speed and express rail. China will also have unprecedented auto-congestion and need for last-mile solutions. China is not paralyzed with NIMBY or government gridlock. China could plan new forms of urban mobility in new cities and then quickly implement the plan. In the U.S. many people that I interview who are under 30 and living in cities or university towns, tell me that a car is not something to own, it is a service to use along with rail, transit, walking, and bicycling. When needed, they use Zipcar or another car share service, they rideshare, they squeeze into a taxi when leaving a club on a Friday night. Millennials may take to new innovations in urban mobility as easily as they took to the internet, social networks and smart apps. At times, leaving the auto behind can lead to a pleasant car-free vacation or a carefree commute.